Our latest round was run at Joe's last Saturday the 13th of May. A few less runners this time but at 13 it was near enough spot on. The sheep stations were up for grabs too with plenty of dummy spits about poor marshalling causing so and so to loose time. It usually evens out in the end though as we are all in the same boat. Unless of course someone spoils my night. First up for the night was Restricted DTM. 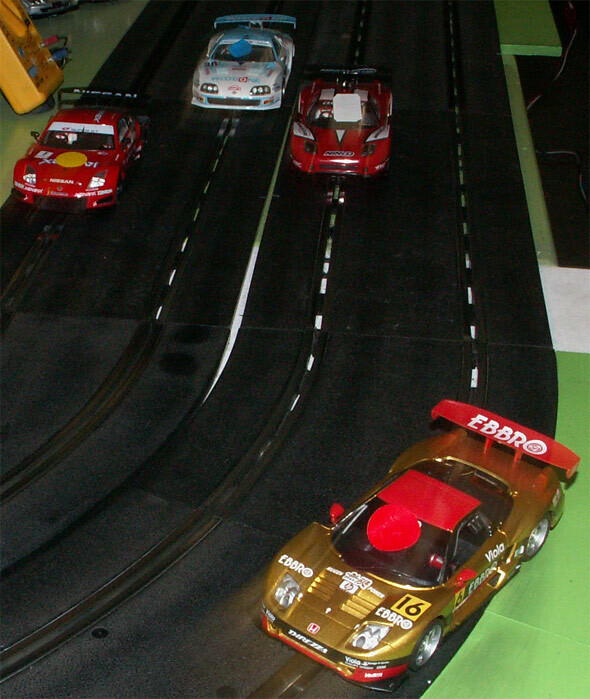 On Joe's track the rules worked quite well even with Ninco cars being restricted to run NC1 motors. Basically it is Ninco's with NC1 motors and all other brands running their base motor. 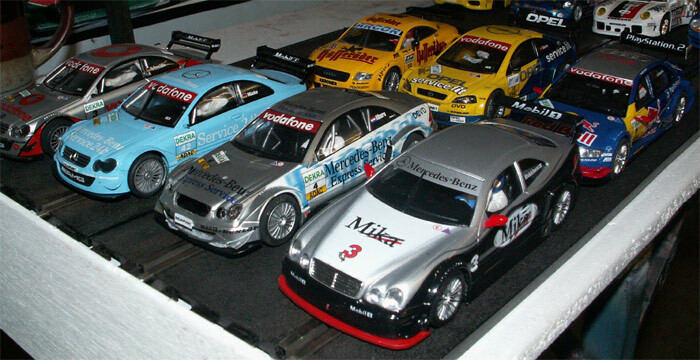 This pic shows a few of the cars running with my Mika Hakkinen Ninco Merc being bought out of retirement for another race, this time with NC1 power. The three pointed star on the bonnet survived another round too. 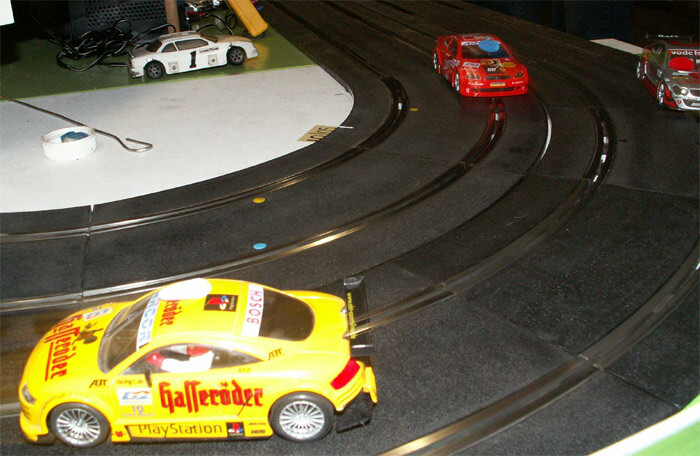 SCX, Scalextric, Carrera and Pro Slot all ran on the night too. 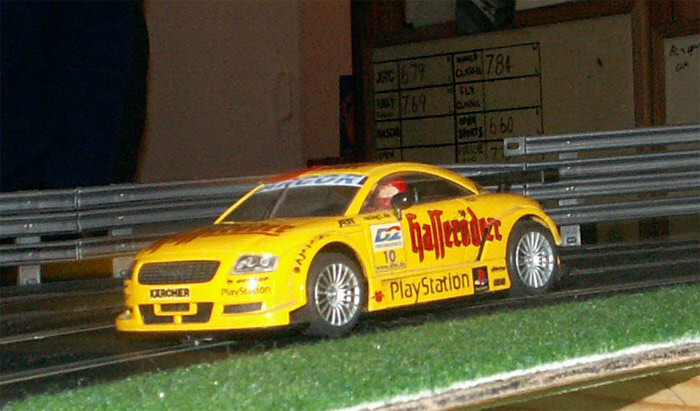 One of Bo's early cars was his Ninco Audi TT with NC1 power. Here he is crossing the flyover with them rear wheel in the air. 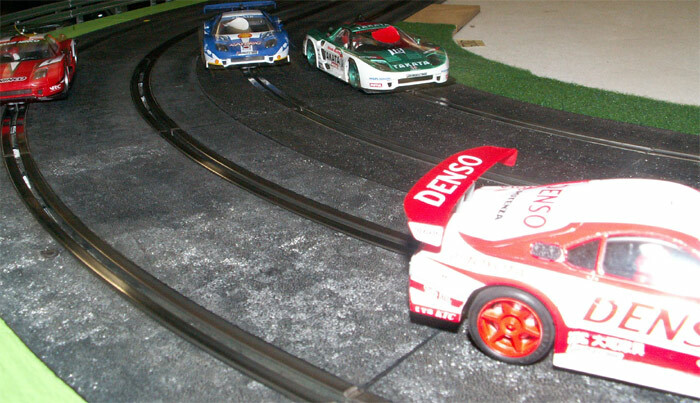 Bo again leading this heat with Cameron Ninco Astra and Al Scalextric Merc following. then came Chris, Damien, The Head Master, Cameron, Gary and Nigel. 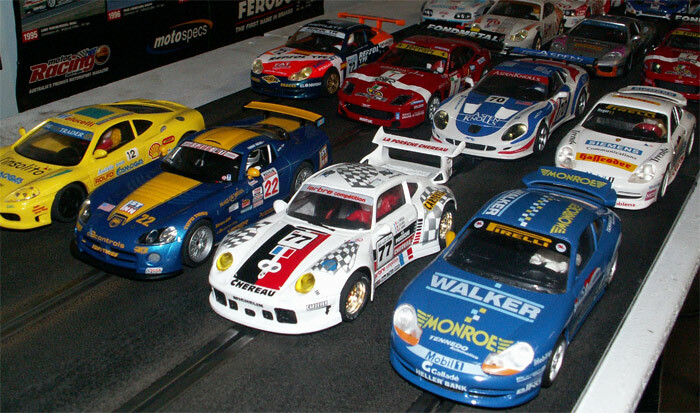 Here are a few of the Restricted Sports cars. 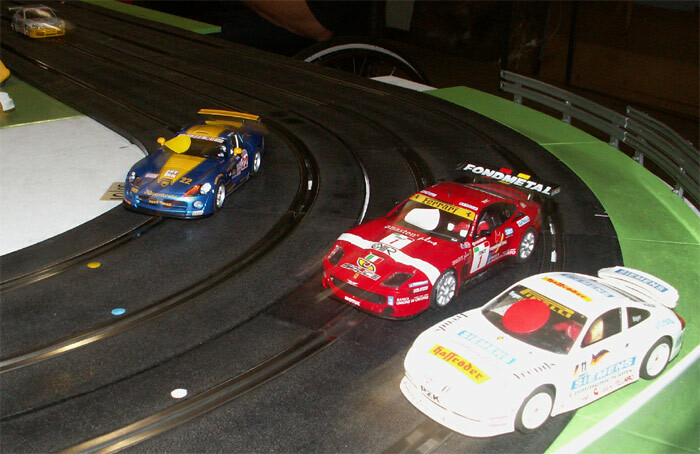 We allowed NC2 motors in Ninco cars here but I stuck with the tried and true NC1 motor in my Walker Porsche GT3. 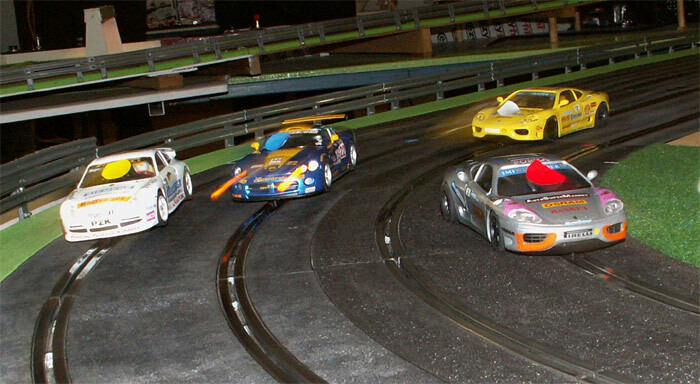 There were SCX Ferrari 550's Pro Slot Ferrari's and Porsche's Scalextric Vipers Ninco Calloways. First heat and Joe is just edging Devious Dave from Daniel in Viper and Craig NC2 Porsche. Chris heads out Joe, Daniel and his dad Charlie in the ailing Ferrari 360. The Head Master had a shocker with his Ferrari suffering some sort of Gremlin the whole round. Cameron with the NC2 Ninco Porsche running away from Chris, Sheep Station Al and Craig. then came Bo, Gary, Damien, Craig, Chris, Nigel and The Head Master. Last up for the night was the JGTC round three. Devious Dave was first to show with a new Nissan 350 Z and it proved its worth straight up. Bo is leading this heat from Pauls beaten up old Honda from The Head Masters Ninco club car and Al's Honda. 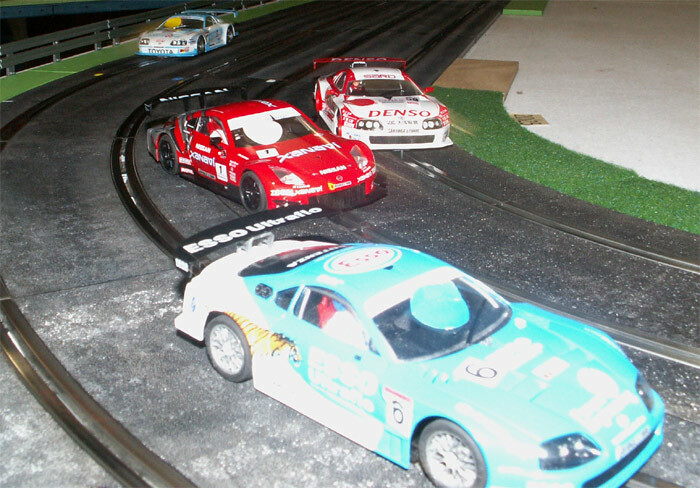 Here Joe just leads Dave's new Nissan from Bo with Craig chasing them all. Chris gets the holeshot from Dave, The Headmaster and Daniel. then came Charlie, Cameron, Bo, Gary, Al, Nigel, Damien and Craig. A fun night by most and a laugh with the headmaster bellowing out at the top of his booming voice stirring the pot. Maybe we need a marshalling roster but in the end fellas, it is just for fun so settle down. Next time I am bringing boxing gloves. Edited by gazza, 21 May 2006 - 08:45 PM. Hey Vinno should I bring down a cattle prod for you ? I don't need it but it may help to get those marshalls moving. But on second thought the Head Master (Charlie) should scare everyone to thier post when he waves around that big stick. Luckily we are racing rally this weekend coming at Gazza's so no Marshalls required. If you have one can you bring it though as I would sure like to have a go with one. I would like to see someone shake rattle and roll. Is it electric? I can't find the evil smile so just imagine I have put one on my post. I have a story to tell of the nights racing but I am waiting for Channel 9 to contact me about TV rights. Until then I have no comment other than to say someone must have got in the area where the cars are stored before the race and let the tyres down on my Restricted sports Ferrari. I cannot see how it can go from ledership hopefull to last place in one meet. I have organised for some fuel samples to be taken. Makbe drug testing of the top three is in order. I suspect illegal caffeine levels in their blood. Gee that would bump me up to first how convenient. Or just farts for that matter. Beware of garlic prawns and beer. A potent combination if I do say so myself.